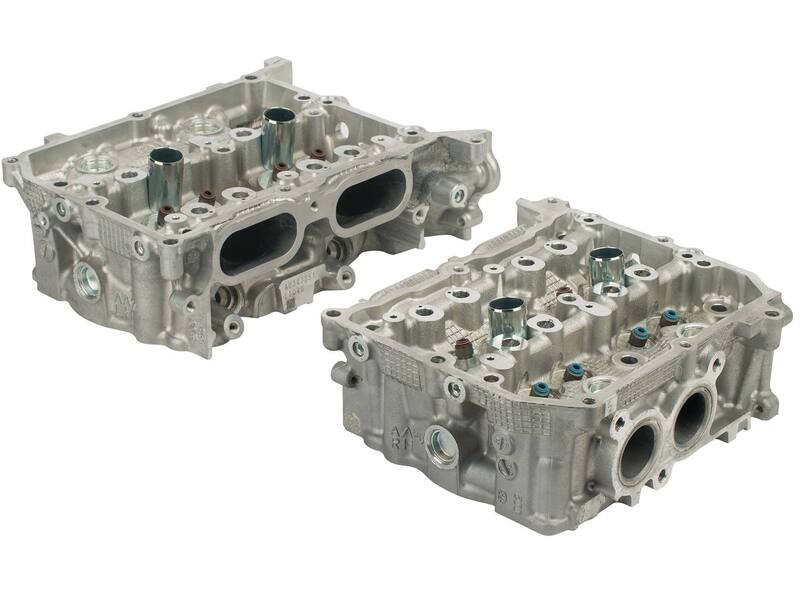 While they may share many similarities, the differences between the cylinder head on the FA20 engine found in the WRX and the BRZ/FR-S/86 are vast. Instead of taking the “let’s keep it simple” approach to making a turbo and non-turbo variant of an engine, Subaru opted to optimize each engine for its specific application. The non-turbo FA20 found in the BRZ/FR-S/86 has a cylinder head optimized for higher-RPM, naturally-aspirated performance. Its head design is all about flow and filling the cylinders without the aid of boost. The turbo FA20 found in the 2015+ WRX has a cylinder head optimized for quick boost response and a broad-flat torque curve that takes advantage of the AWD traction. Its design is all about flow velocity and response. While this delivers a fun experience at low and mid RPMs, it can also give the feeling of running out of steam at higher engine speeds. So how do you get maximum performance in either application? First, we’ll need to understand the reasons behind each head design. Second, we’ll take a look at how to improve each of the heads for various applications. Finally, we’ll evaluate some of these modifications on the flow. In part two, we’ll put the upgraded WRX head to the test on the dyno. Big, wide, and straight intake ports on the BRZ/FR-S/86 cylinder heads allow exceptional cylinder filling without the aid of forced induction. These big ports are optimized for high RPM and as a result peak torque occurs at a very high engine speed. When you don’t have forced induction assisting with the filling of a cylinder, making horsepower is solely a function of engine displacement, engine speed and engine efficiency (volumetric, thermal and mechanical). When Subaru set the design goals for the FA20 in non-turbo form, its mission was to hit 200 flywheel horsepower by 7,000RPM. This required the same engine efficiencies as the AP1 S2000 F20C engine that delivered 237 horsepower at 8,300RPM in the mid 2000s, so the Subaru engineers knew it was an achievable goal. They opted for a combination fuel-delivery system that employs both conventional port fuel injection and direct-injection. By selecting direct-injection, a higher static compression ratio could be run without encountering detonation. While Honda’s F20C sported an 11.0:1 static compression ratio, Subaru’s FA20 was able to be designed around a higher 12.5:1 static compression ratio. This 1.5-point increase in static compression ratio improves the engine’s thermal efficiency by about 5.0 percent over the F20C. Increased thermal efficiency reduces the engine’s appetite for fuel, so fuel economy was also improved with the higher compression ratio. By maintaining conventional port fuel injection, valve deposit buildups are not an issue. With the cylinder head, Subaru went with an aggressive large rectangular intake port that we measured at 210cc in volume. The large port feeds a pair of 35mm intake valves with 5.5mm stems that are controlled by roller finger followers tied to an inverted radius camshaft that lifts the valves to a very respectable 10.6mm. The combustion chamber has also been designed with flow in mind as an open pentroof design is used that provides maximum unshrouding of the valves. 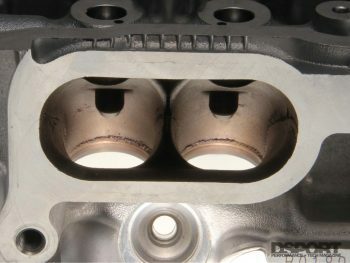 At peak valve lift with the stock cams, the intake section of the cylinder head flows about 265cfm. The exhaust port on the FA20 retains the non-symmetric layout similar to the EJ with one port center of a cylinder and the other offset required a dog-leg path. Exhaust flow hits over 180cfm at peak valve lift. The resulting flow balance is about 68.5% (exhaust as a percentage of intake). This ratio is in the sweet spot of most of the high-output naturally-aspirated engines currently being produced. Combustion chamber on the WRX head is a classic pentroof with quench pads, ideal for boost. When you have a compressor (turbo or supercharger) forcing in the air to fill a cylinder, the port and valve size doesn’t need to be as large since positive boost pressure will increase the flow through the intake side of the cylinder head. A naturally-aspirated engine works a bit like a siphon. The larger the hose, the more flow you can get through the siphon. A forced-induction engine works like a hose hooked up to a faucet. The size of the hose is a factor, but the pressure that is set by opening the valve has a bigger impact on the ultimate flow. The higher the pressure, the higher the flow until you reach a limit. It’s only at this limit that the ultimate flow potential for that size of hose is realized. In the past, many manufacturers simply used the same cylinder head on both the turbo and non-turbo variants of an engine. Had Subaru taken this approach, the peak power on the WRX would have probably been about 15-20 percent higher at the same boost levels but it would have occurred around 7,000RPM. However, peak torque would have also occurred at a higher RPM than with the WRX head. The most substantial impact would have been on off-boost throttle response. By engineering a head with smaller ports and intake valve, flow velocities were kept higher. This results in crisper throttle response. Subaru engineered the combustion chamber with quench pads that trade off a slight flow advantage in favor of much improved mixing and detonation avoidance. While the turbo engine’s 10.6:1 compression ratio sacrifices some thermal efficiency, it actually increased volumetric efficiency under boost as the additional chamber volume gets filled with more air and fuel to produce more power. 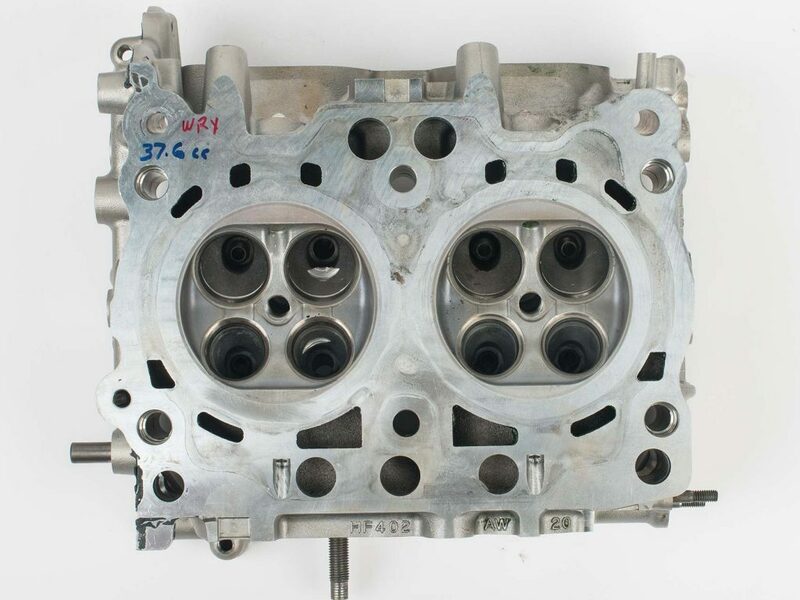 With the cylinder head, Subaru went with a mild semi-rectangular/hexagonal intake port that is about 165cc or about 80-percent of the volume of the non-turbo head. Intake valve diameter was reduced to 34mm. The exhaust port on the FA20 turbo is very similar to the non-turbo head measuring just 2cc smaller. Exhaust flow was within 5cfm at peak valve lift. The resulting flow balance is about 80.0% (exhaust as a percentage of intake). This ratio is in the sweet spot of many of today’s turbo engines. 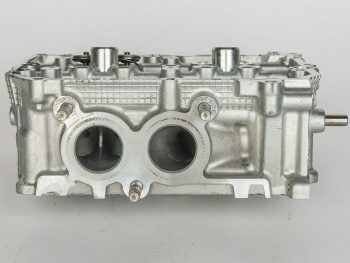 While Subaru engineers accomplished their targets and goals with the turbo head design, a poor decision (in the opinion of anyone that’s looked at the intake port of a direct-injection-only engine after 10,000 miles) was made along the way to solely rely upon direct-injection for fuel delivery. 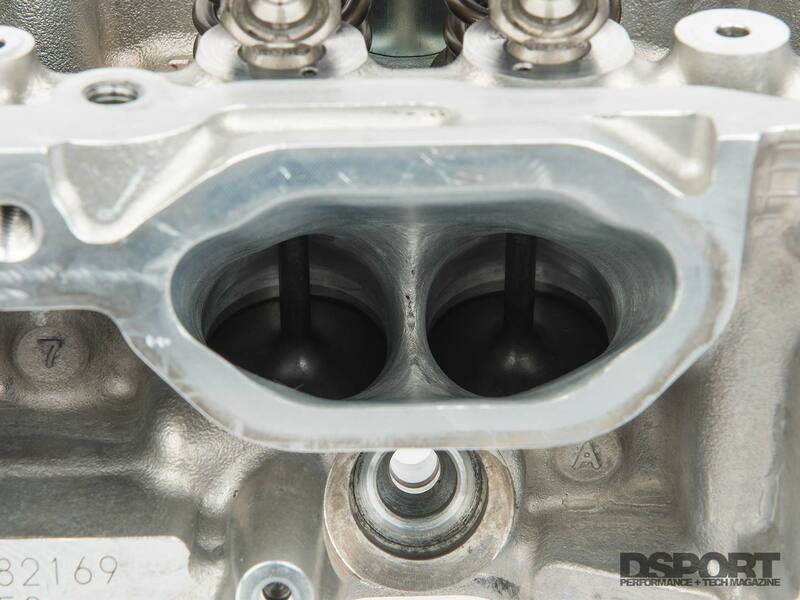 As more and more owners of vehicles with direct-injection-only have realized, intake valve deposit formation is a real issue. Regardless of the OEM, we’ve seen intake valve buildups on these engines that significantly impact performance over time. One of the simplest solutions is to simply install a direct-port water or water-methanol injection system. These systems will deliver the water or water-methanol mix to the back of the intake valves allowing all of the deposits to be cleaned away. More displacement and higher engine speeds help offset the laggy nature of big ports. So if Subaru got the engineering right on the cylinder heads for both the turbo and non-turbo variants, is there room for improvement? It depends on your goals. If you are happy with the power output from the factory engine, leave it alone. However, if you have a soul and you value performance, there is much to be gained by optimizing the cylinder head to meet your goals. Which cylinder head you are starting with and what your desired goals are will impact which path to follow. The best path for a BRZ owner planning to keep it “all-motor” is different from the path of a BRZ owner planning for forced-induction. Red plot is a stock WRX engine. Blue is the BRZ. 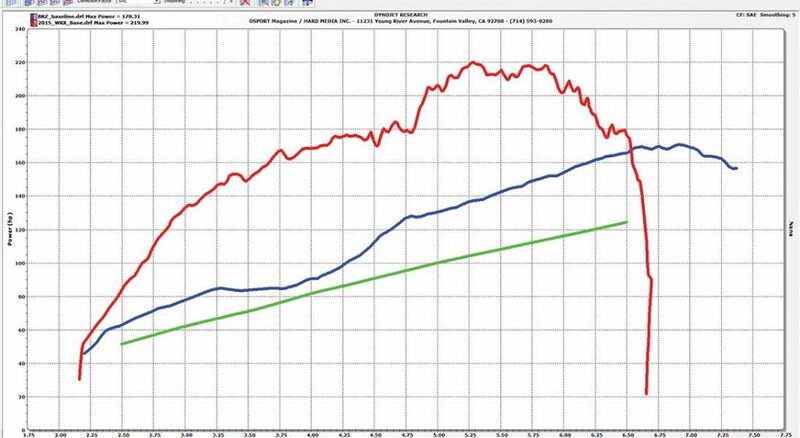 The green line represents the power output of the WRX if there wasn’t a turbocharger creating boost. As mentioned before, the only way to horsepower in a naturally-aspirated engine is through displacement, RPM and improved efficiencies. With the FA20 platform, Club DSPORT and others have developed stroker kits that can take displacement up by 5.0% (2.1L, 86×90-bore/stroke). 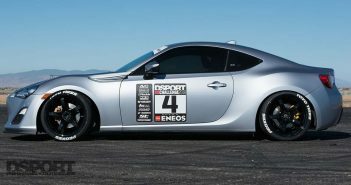 Club DSPORT also offers a big bore/stroker option which can increase displacement about 12.5% (2.25L, 89×90-bore/stroke). The increases in displacement go hand in hand with increases in power and torque. So if your engine is making 200 horsepower as a 2.0L, it should make 225 horsepower as a 2.25 liter. 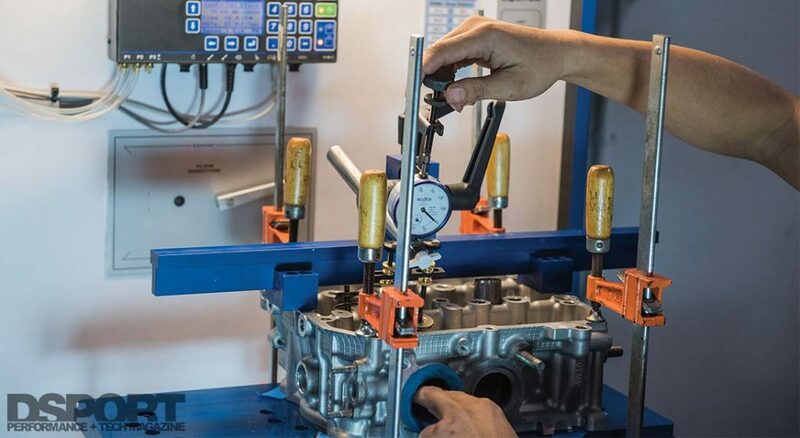 In the case of the FA20 non-turbo cylinder head, very little needs to be done to optimize performance if the peak horsepower and RPM is going to remain the same. A great valve job and you are good to go in most cases on the 2.0 and 2.1-liter builds while a 2.25 liter may appreciate a +1mm intake valve with some minor bowl work too. But if the goal is to make peak horsepower at 8,500RPM instead of 7,000RPM (assuming you figure out how to make the valvetrain survive at those engine speeds), then there may be some merits in very minor port work too. Unfortunately, camshafts (the orchestrators of the valvetrain) for the FA20 engines are not easy to produce. The factory engineered the valvetrain around complex convex profiles that if done incorrectly can wreak havoc on valvetrain stability. Good news. You don’t have to go crazy on the cylinder heads. Similar to the FA20 non-turbo NA build, a great valve job will do the trick in most cases on the 2.0 and 2.1-liter builds while a 2.25 liter may appreciate a +1mm intake valve with some minor bowl work, too. 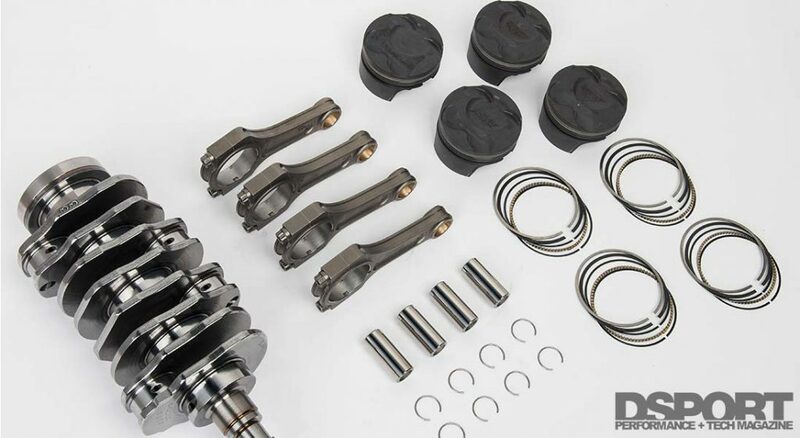 Make sure to stick with camshafts that use inverted radius/convex ramp profiles and upgrade the exhaust valves to an Inconel-like material. You saved money not getting the STI, but now it’s time to break open the piggybank. The main performance governor on your engine might be the cylinder heads. Unfortunately, it’s not the only performance governor. The lack of port fuel injection not only gives you an intake valve deposit issue to deal with, it also makes it hard to meet the fuel demands of higher horsepower goals as the direct-injection system maxes out. 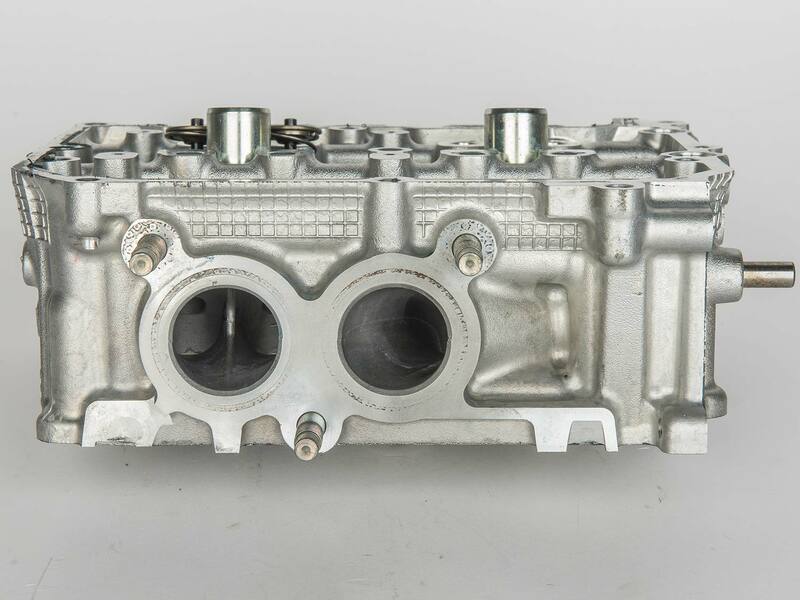 While Club DSPORT had thought its FA20 engine development program would be serving both the WRX and BRZ/FR-S/86 community, there’s only been one WRX short block sold for every 30 BRZ/FR-S/86 shortblocks. 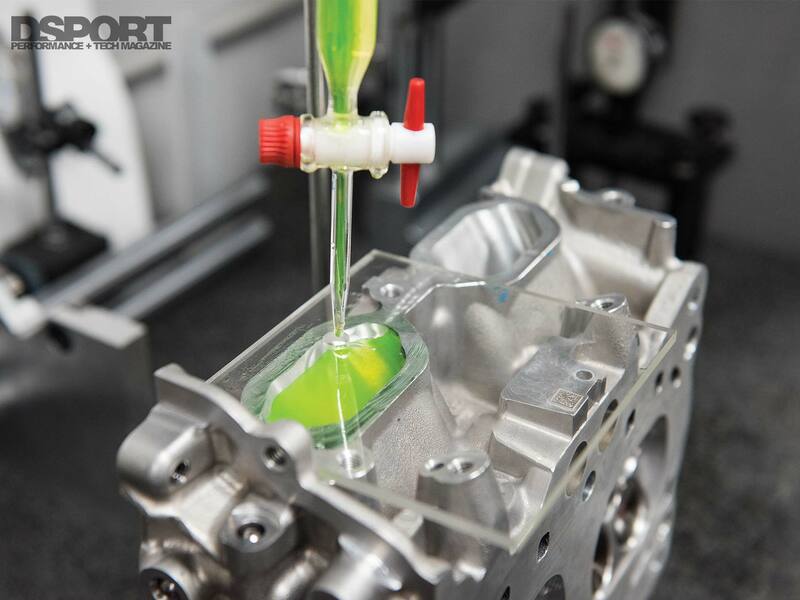 However, Club DSPORT recently had an opportunity to rework a WRX FA20 cylinder head for a local tuning shop. The modifications made to this head should really wake up the performance on the dyno. The goal of this project was to see if the WRX FA20 cylinder head could perform on the level of the BRZ/FR-S/86 cylinder head. Just copying the intake port shape and size over from the BRZ head to the WRX isn’t an option. The actual port location is slightly different and a different intake manifold is used on each application. The volume of the intake ports is substantially different. The WRX intake ports are less than 80 percent of the volume of the BRZ intake ports. This would mean a massive amount of porting would be required on the intake ports. Rather than trying to make the ports as large as possible (which would have resulted in great numbers on the flow bench but poor results on the dyno), we instead focused on optimizing the port shape. The walls were widened and the roof was raised to allow a better, more gradual turn from the port to the valve. In the end, the volume of the port was only increased 10 percent. While we didn’t have the time to do a 3D digitizing of the ports before and after the porting process, we do know that the throat area (critical area downstream from the valve) was increased on the same order as the intake valve area increase (also 10 percent). The +2mm oversized intake valves, oversized intake valve seats and days of porting work developed a nicely shaped port that fell about 3.5-percent short of the flow numbers of the BRZ port on the flowbench. 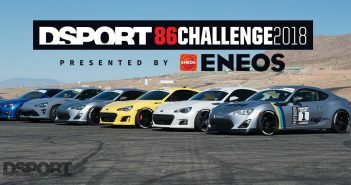 However, considering that the port achieved these flow numbers with a volume that is only 86-percent of the volume of the BRZ head, we expect it to be able to be superior in velocity. This will keep off boost-response and performance high while also having a good chance of actually outperforming the cylinder filling capabilities of the larger size, higher flow low speed BRZ port. The SuperFlow 750 flow bench was set up with an 86mm cylinder fixture to measure the static flow potential of the intake and exhaust ports. On the exhaust side, the port was also increased about 10 percent in volume. 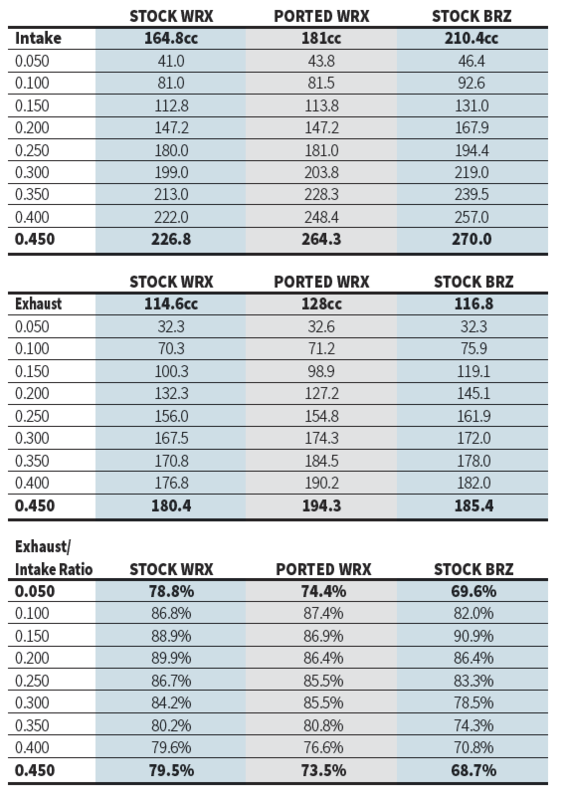 The reshaping of the port and the inclusion of the larger +1mm exhaust valve allowed the ported WRX head to outflow the BRZ head on the exhaust by almost five percent at peak valve lift. 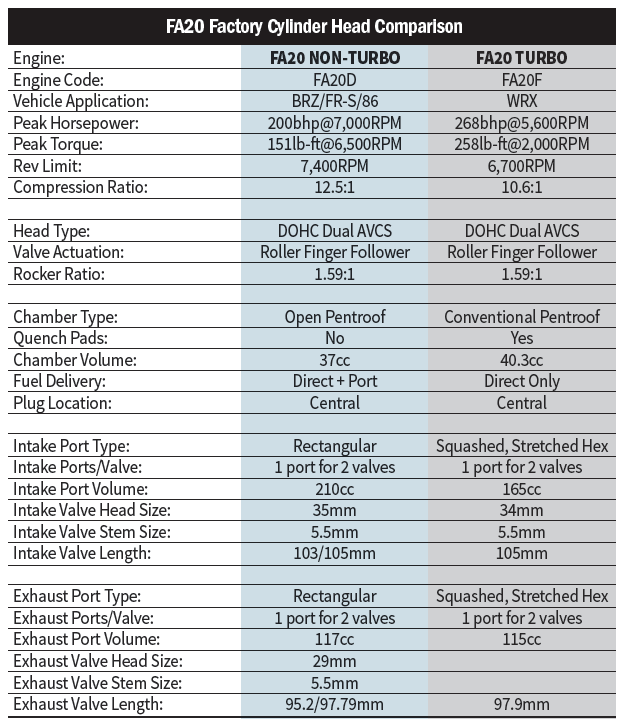 Compared to the unported WRX head, the flow was improved by nearly 10 percent. The cross-sectional area of the ports will determine the velocity characteristics of the cylinder heads. When comparing like heads, a comparison of the port volume can be used. Notice how large the BRZ intake port is compared to even the ported WRX. Make ports giant and you can probably have a head that delivers good flow numbers. However, if the flow improvement comes at the expense of a reduction in flow velocity, the net gain will be non-existent or a loss. DSPORT readers are going to have a much greater understanding of cylinder head flow dynamics and development in the coming months as Allan Lockheed Jr. (Engine Development Consultant and Club DSPORT’S Engine Development Guru) and Craig Gerfen (Race Engine Systems) walk us through the development of a ‘70s-era cylinder head to 21st-century performance. “Velocity trumps airflow,” is just one of the laws of performance that will be explored. How much of an improvement can be made? Well, we plan to take one of the worst performing engines of all time and turn it into a respectable and impressive performer. 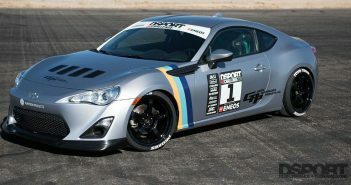 If you have a BRZ/FR-S/86 FA20, we have good news. You don’t have to worry about investing big dollars into your cylinder head whether you are staying all-motor or going forced-induction. WRX owners that want big power, you aren’t so lucky. It’s time to open up those wallets if you are ready to get serious about performance. “It all in your heads” is part of the lesson to be learned. Just how much performance increase can be expected? We’ll find out shortly once we get the WRX on the dyno with these reworked cylinder heads.